Conflict Behavior in Dogs | Train Positive Dog! Lowest Yellow Level: When first put into conflict, dogs usually prefer to avoid conflict and will leave. Often, they can’t leave – they are on leash with you, on the table at the vet office, in a small yard, etc. Red Level – If they can’t leave and confronted with a dog, or other animal (or person) they may show appeasement behavior – “please don’t hurt me”- puppy-like behavior such as whining and pawing. Orange Alert Level – growling – warning! If conflict continues, growling warns that a bite is coming. Growling is important information from our dogs, and we should not try to suppress it by using punishment, which still leave the dog in a state of arousal. Instead, we should work with the dog in a similar situation, in a lower state of arousal, to change their attitude so they are no longer in conflict. Uppermost Levels – If conflict continues, snapping, then biting with contact. Obviously, we want to avoid pushing the dog to this level. Not all dogs will clearly go through all the levels before the BITE!, but bites do not “come out of nowhere” – there is always an indication of the escalation of arousal, but humans do not always see it. Dogs do not always show all the behaviors described in the different levels of arousal – it depends on the type and intensity of the conflict, and the temperament and experience of the individual dog. 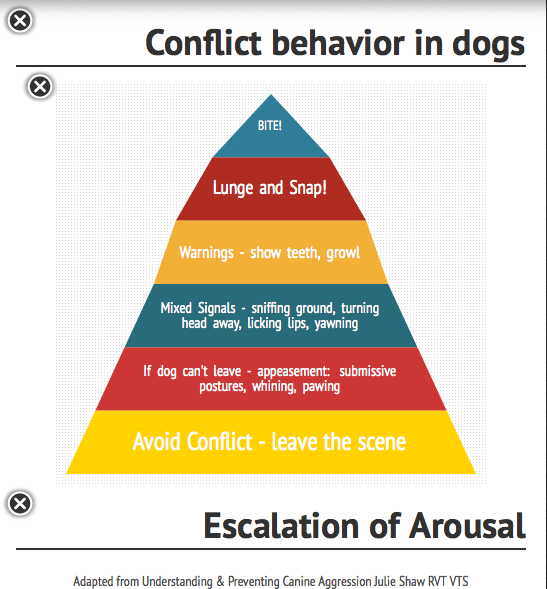 When dogs are in conflict situations, physical punishment can cause them to further escalate in arousal; it can cause them to move up the pyramid towards BITE! That is why, if your dog is already aroused, yanking on their leash or collar, hitting them, or pushing the button on a shock collar is not a good idea. It may simply cause them to be more aroused, increasing the aggressive behavior and moving the dog farther away from self control. It is also possible that punishment may inhibit the behavior and bring the dog back to the appeasement level of the pyramid, but it does not eliminate the inner motivation for conflict. That is why some dogs have learned not to growl, but to go directly to Lunge and Snap!